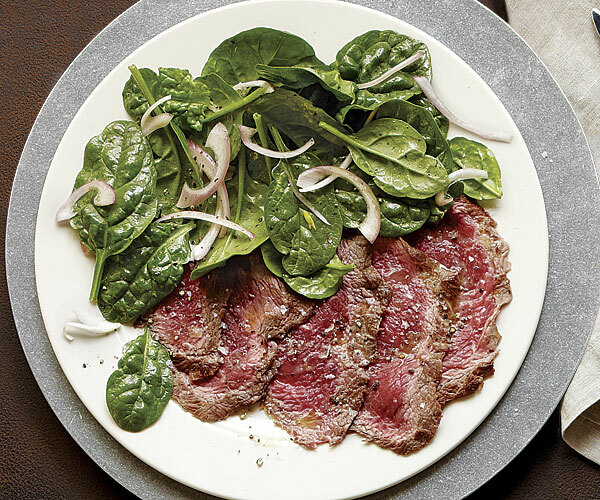 Quick-pickled shallots give thin, silky slices of meat (and the accompanying spinach salad) a tangy punch. A Côtes du Rhône Villages Massif d’Uchaux Red offsets the acidity with its red-berry aromas and floral notes. Pat the petite tender dry and season it all over with 1/2 tsp. kosher salt. Heat 1 Tbs. of the oil in a heavy-duty 10-inch skillet over high heat until shimmering hot. Add the petite tender and sear on all sides, 4 to 5 minutes total. Transfer to a cutting board and cool to room temperature; cut crosswise into 20 slices. In a small bowl, soak the shallots in the vinegar until slightly softened, about 30 minutes. Transfer 2 Tbs. of the vinegar to a small bowl and whisk in the remaining 1/4 cup oil and a pinch of salt. To serve, strain the shallots, discarding the remaining vinegar. In a large bowl, toss the shallots with the spinach and just enough of the vinaigrette to lightly coat the leaves. Divide the slices of beef among 4 dinner plates, arranging them in a single layer with just a little overlap. Drizzle with the remaining vinaigrette and sprinkle with a pinch of sea salt. Mound the spinach next to the beef and season the spinach and beef with a few grinds of pepper. Wine Pick: Pair with Côtes du Rhône Villages Massif d’Uchaux Red. 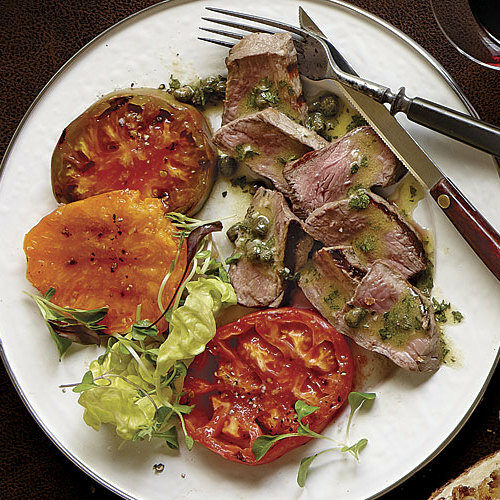 Shoulder petite tender is a relatively new cut of steak that can be an affordable alternative to similarly shaped beef tenderloin; however, if you can’t find it, tenderloin also works well here.